It's said that a haunting is the residual effect of someone's life force being attached to a location. This could be some place they were very fond of or some place where life was removed forcibly or violently. It stands to reason then that the men who fought so passionately over a cause they believed in to their very core would remain on the fields where they fell. War, in 1863, was hell. The minnie ball was a round projectile made of lead. When shot, it expanded and could fell a target at half a mile. One of the most deadly cannon munitions was called grape shot. Small iron balls were wrapped in a bag and tied, making the bag look like a bunch of grapes. Fired from close range, the bag disintegrated spewing the shot on a wide variety of targets. Now days, a bullet into an arm is usually survivable. In the Civil War, if you were shot by a minnie ball, your arm below the point of impact was, essentially useless. Bones and bodies disintegrated upon contact with these munitions. If you didn't die, you still faced the medical care of the time, which was akin to a butcher slaughtering animals. There were no anesthetics so limbs to be amputated were simply hacked off at the point of impact. If you were shot in the torso or head, they merely gave you palliative care until your wounds killed you. It's no wonder a Civil War battlefield is haunted. The violent way men died would leave their spirits imprinted on the land. I can't say, for certain, that I've experienced a haunting. Things have happened that I can't explain. If we believe we all have a spirit of some form, where that spirit goes is a subject of huge debate and speculation. If you were severed violently and against your wishes, from your spirit, what's not to think that the spirit would still reside in that place. Time appears to be more than just linear and what's not to say that an event such as the Battle of Gettysburg would imprint itself on time. We speak of the "fabric" of time and couldn't that fabric bear the images, impressions, thoughts and feelings of the thousands who found themselves against one another in farms, orchards, hills and fields? It's been said that Gettysburg is the most haunted location in the US. I stumbled across this series of books when I was looking for information in preparation for our trip in 2001. At the time, there were five volumes. Six and seven have been released but I have not read them. If you are fond of stories that will send shivers down your spine, the stories contained in this series will do that. Nesbitt's writing style is quite folksy. He has a history with the battlefield so he has some credibility with regards to the stories and events he relates. This endeavor, collecting ghost stories, proved to be quite lucrative and his company runs ghost tours of Gettysburg. I don't remember why Carole and I did not take one. I think it might have been the cost and when they were scheduled. Gettysburg was our first stop on our battlefield tour and we wanted to hit as many parks as possible in a week, as well a fit in a visit to the Museum of the Confederacy for their Robert E. Lee exhibit. What we did, instead, was read all the books and then pick the locations we wanted to visit. I know she was hoping for a ghostly encounter. I was certain that, if we did meet a ghost, I would faint dead away and I really didn't want to find myself face-to-face with a spirit who might not be in the best of moods. There is a story in one of the books about 3 women from New York who were driving in the park late on a summer's evening, when the park is open late. They stopped by the Alabama monument, got out and walked over to look at it. It's a big slab of either granite or marble and it's tucked off the road against some trees where a contingent of Alabama men made an encampment. As they walked around the monument, they started to hear male voices. They couldn't make out what was being said. Then, slowly from the trees, a handful of soldiers emerged dressed like Confederate soldiers. They stopped and looked at the women and one of them said, in a low southern drawl, "You ought not to be here. I think you should leave." The women did just that. We found that monument, in the dark of the battlefield the last day we were there. We didn't see anything. Little Round Top was empty, save for tourists looking over the peach orchard and the wheat field below. Often, visitors report of seeing campfires in both locations at night. We went to the Devil's Den and wandered amongst the rocks. It was warm, I remember. The rocks are naturally reddish which absorbs the sun's heat. Even with hard packed gravel paths, you could feel that heat through your shoes. We found ourselves at the Triangular Field. Some of the fiercest fighting of the battle was here. The field is not very big. It's boarded by trees on two sides and was fronted by a low stacked stone wall. The Devil's Den, which is behind me in this photo, was held by the Union. Confederate sharpshooters hid behind the wall and in the trees and were a menace to anyone trying to take the area. The path visible above, will take you to other battlegrounds. Because of the huge number of casualties here, this is supposedly one of the most haunted places around Gettysburg. In reading Nesbitt's book and in subsequent reading of ghost stories, it is said that cameras will suddenly die while walking in the field. This goes for still as well as video cameras. They resume working as if nothing is wrong once removed from the field. Confederate sharpshooters will be seen standing up from their positions behind the wall, turning and running down the field to the trees but blending in with the light and shadow before getting there. Men are seen at the perimeter of the field as well as bodies lying in the field. There are unexplained lights and mists at night. I know you're waiting for me to say we saw something, but we didn't. The camera worked just fine and because it was a hot summer's day when we visited, we walked the path to the bottom, turned around and came back. Ghosts are not like performers. They don't show up on cue. 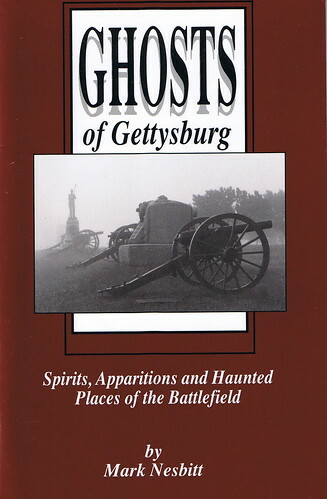 If you are interested in ghostly events at Gettysburg, I recommend these books. They aren't very big, less than 100 pages total, but unless you are a complete skeptic, they will send shivers up your spine. If you're of the "delicate" sort, read them between 10 a.m. and 3 p.m. so that, by the time you are ready for bed, the image of the statue of a young boy turning and facing people is out of your head.